THE first ever straight-line journey from Land’s End to John O’Groats was completed this month by the Beeline Britain team. Arriving at John O’Groats, the UK mainland’s most northerly point, after an epic voyage across the country, the boys were delighted to receive a congratulatory phone call from His Royal Highness Prince Harry. 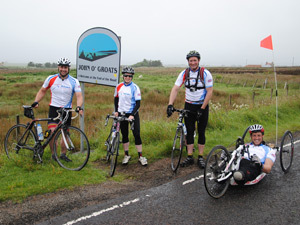 Supported by Prince Harry’s Endeavour Fund, they covered over 1,100km by kayaking, cycling, mountain biking and hiking their way across the UK completing two record breaking sea crossings en route, including the longest open sea kayak crossing in the UK; 34 hours non-stop! The team of four, which included Paralympian and double amputee Army veteran Nick Beighton, have tackled the UK’s toughest terrain to raise money for BLESMA; the limbless veterans charity. Beeline Britain have taken an iconic UK challenge and given it a new twist, showing ingenuity, determination and physical endurance in support of our injured veterans.